Visit Canadian Ardene stores or official website and make your closet happy. The have prepared an amazing offer for you. Buy one get one for $5, offer includes dresses, graphic tees, tanks, crop tops, skirts, rompers and so much more. Second item must be of equal or lesser value. Official source of the information is Ardene official website. 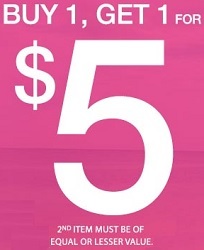 For more information about this promotion visit your nearest Canadian Ardene store.